of Southeast Texas. Refinery expansions, directional changes in industry growth and deepening of our shipping channel all play a part in this rebirth. From this growth, thousands of jobs are expected to be created and millions of dollars driven into the local economy. This will help every resident of Southeast Texas. History, Section 1 of our series of four editions, which you are currently reading, publishes on Saturday, April 6. It focuses content on the history of how the industry all started. From Spindletop to today, ours has been a special journey. ers, petrochemicals and the shipping channel. Our industry plays an enormous role in making our community what it is today and what it will be tomorrow. We look forward to sharing the 2019 Progress Edition with you. We hope you enjoy it as much as we enjoyed creating it. Keep it, share it, enjoy it over and over again. 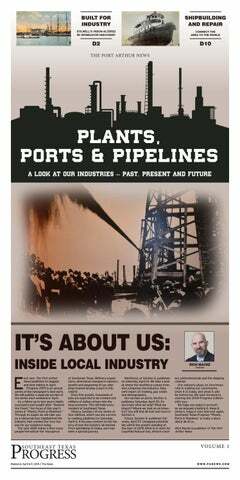 Southeast Texas Progress “Plants, Ports & Pipelines” is really a story about all of us. Drawbridge over the ship canal at Pleasure Pier. Postcard shows the harbor near Texaco Island. nal and on a 2,500-foot pier. By early 1898, railcars carried freight to warehouses and piers near the end of Houston Avenue and tugs towed barges to ships at Sabine Pass. Step by step, Jesus has engineered a promising future. Flint Hills Resources proudly recognizes Port Arthur Memorial High School senior Jesus Gonzalez. Through hard work and dedication, Jesus aims to be the best at everything while helping his classmates succeed. With his academic achievements, Juan has designed a solid foundation to accomplish his goals. From all of us at Flint Hills Resources, we salute you. The port at Port Arthur. Postcard shows Gulf Oil Refineries. through Stilwell’s canal on Aug. 13, 1899, according to the “Port Arthur Centennial History.” Stilwell’s plans were altered soon enough. Stilwell lost control of his railroad to John W. Gates in 1899; on Jan. 10, 1901, the Spindletop oil gusher transformed the Texas coast into an oil hub. “Refiners brought a brand new industry to Port Arthur,” Monroe said. “They were interested in an outlet for their product.” Port Arthur had rail and a port and a canal. It all meshed with what oil refineries needed, Monroe said, to distribute their products. “That’s what kicked it off, the major discovery at Spindletop,” Monroe said of the industrial boom. Spindletop depicted in a mural at The Museum of the Gulf Coast. Postcard shows the bridge over the Neches River at Port Arthur. The quest for energy riches drove additional work along the western shoreline of Sabine Lake. CERTIFIED PERSONAL RISK MANAGERS Offering premiere products and services custom tailored to your specific risk tolerance. to substitute our judgment for theirs.” It was a different time. Automobiles were also invented at this time and Spindletop helped push manufacturers towards the type of fuel that would be used. “They were trying to choose between electric-powered cars and gas-powered cars,” Gray said. “The sheer amount of oil they found here really pushed them to the gas-powered cars.” The gasoline-powered engine was developed in 1885 and manufacturers of horseless carriages knew that they needed oil to power their machines. But where would they find it? With Spindletop, which produced 100,000 barrels a day, “they felt like they could do it,” Gray said. Gray said the amount of oil found at Spindletop pushed both the American and British navies to switch to fuel power rather than coal. That was an important development. decided to lean into the new rush. “Some knew there was nothing they could do,” he said. “People started to change their prices to make it work for them. The barber prices we have listed in the museum are inflated prices.” While the gusher lasted nine days, Gray said the chaos lasted much longer. Those interested in learning more about Spindletop can visit the Museum and recreated city located on the Lamar University campus. quickly grew. A lot of the smaller ones that grew were bought out by the bigger ones.” Gray said other companies like Guffey (later changed to “Gulf”) and Texaco formed during that time. “Shell was an international company that contracted with Gulf Oil to do refineries and later, for some reason, Gulf bought that contract back,” Gray said. “They’re still around, so I guess it worked.” Gray said many people didn’t want Standard Oil to come into Texas due to an ongoing antitrust lawsuit against them. “They didn’t want Eastern influence,” Gray said. With the local growth came people of all races and backgrounds. African American communities sprang up soon after the boom, including the south Beaumont neighborhood of Pear Orchard and a traveling settlement around the oil fields known as Little Africa. Gray said African Americans and Mexicans weren’t allowed to own oil companies, but promising job opportunities led many people to the area. “They came here because they still got jobs as teamsters and ditch diggers,” Gray said. “They came here because even though they didn’t get the best jobs, they still got jobs.” While these positions offered consistent wages, an African American oil worker could work as a laborer for 30 years with little to no increase in pay. The Museum of the Gulf Coast. Mass manufacturing of the automobile drove the demand for oil. industrial prowess seem likely to slow. Discovery of natural gas supplies in Texas and the development of processes to export liquefied natural gas — LNG — is creating the opportunity for new prosperity for Southeastern Texas and southwestern Louisiana. “The foreseeable future is LNG,” Monroe said. And there is a foreseeable future for industry here. stood the concept of the age of the earth based of rock formations, those who were in the business of searching for oil were searching for patterns observed at previous discovery sites. “Academic geologists already had the concept of geologic time,” Texas Energy Museum Director D. Ryan Smith said. “It wasn’t unheard of. It wasn’t popular because you run into that conflict of science and religion, but universities were teaching geological studies and sedimentation patterns, but they didn’t necessarily correlate it to mineral discovery or the extraction of minerals.” Smith said early oil geologist were basically amateurs who made decisions based off observations of the geographical terrain of previous oil discoveries. Smith said oil wasn’t typically being found in an area like Southeast Texas. “They were in areas with glacial till,” he said. “Up in Pennsylvania, there were harder rock formations. It would’ve been 300 million years ago that oil was formed in those areas. The creeks there have rock bottoms. People were looking for things like that. “Around here, you have black, gumbo soil and flat planes. The concept of salt domes was kind of unknown. If they saw red earth and a granite formation next to this sedimentary rock outcropping, they say, ‘Well, we found oil out there two years ago, let’s try again.’ It was, kind of, guessing, but they used some evidence also.” After the initial boom of Boomtown, those looking to make their fortunes from the black gold packed up and searched other areas looking for the next strike. By the early 1920s, Gladys city resembled a ghost town. On Nov. 13, 1925 one local’s theory paid off in what would be known as The Second Spindletop. The Texas Energy Museum gives visitors a chance to learn more about the history and science of the area’s largest economic resource — oil. of Spindletop and Sour Lake,” in time for the plant’s centennial celebration in 2003. His father was a welder at Texaco’s Port Neches location, and, naturally, he was eager to take a job there in 1968. A wooden pipeline that transported oil to the refinery. The boom had a profound impact changing a lumber, cotton and rice town into an oil refinery town from then to the present. “You had three things that made this area perfect for the boom,” Smith said. “You had the proximity to the crude material. You didn’t have to send it very far. Then, you had proximity to water, which you need for cooling your furnace and shipping methods. Southeast Texas also had a large labor force ready to work because they’re coming out of cotton fields.” The events that took place in Southeast Texas in the early 1900s still have a great impact on today’s local economy. The area is still known for being one of the refining capitals of the world and jobs are still being created from plant expansions and channel deepening. Case shows products that came from the Motiva plant. A vehicle from the drilling division at Sour Lake. This model shows the Motiva plant as it was, probably in the 1950s. Employees recognized for 25 years of service at the Port Neches facility, 1934.
were meetings held there; it had the largest meeting space on campus. For museum content, Gish himself was a great starting point. Jasmin’s love for numbers add up to a bright future. Flint Hills Resources proudly recognizes Port Arthur Memorial High School senior Jasmin Reyes. Known by her teachers as remarkably talented and hardworking, Jasmin excels in class and strives for perfection. With her love of math, Jasmin has calculated an incredible future. From all of us at Flint Hills Resources, we salute you. Wagon delivers oil products, 1910. Plate logo was used from 1910-1927. About 750 were issued. TURNER INDUSTRIES – Texas Pride Since ‘75 For over 55 years, Turner Industries employees across the Gulf Coast and beyond have answered the country’s toughest industrial challenges. They provide one solution for your success with industrial construction, maintenance, turnaround, pipe and module fabrication, equipment, rigging and specialized transportation, and associated specialty services. Turner Industries was founded in 1961 by Bert S. Turner when he bought Nichols construction company out of bankruptcy and began providing industrial construction services along the Mississippi River. When Bert bought the company, it was just a 1,200 sq ft building, a few pickup trucks and a small flatbed truck. Soon he began expanding the provided services and the company’s work radius. Turner Industries’ Texas operations began in 1975 when Bert opened an office in Beaumont, Texas. It soon became apparent that the Golden Triangle and Houston Ship Channel would be the nexus of refining, petrochemical, and chemical industries in Texas and the world. To respond to growing client demand Turner opened an office outside of Houston in the late 80s. Over the decades, we have greatly expanded our Texas footprint and continuously invest in new offices and facilities to better serve our clients. Today, over 5,000 skilled craft and professional employees are part of the Turner Industries family - from the Gulf waters of Corpus Christi to the open fields of Paris, Texas. Turner Industries is proud to call the Golden Triangle home and honored to play a role in the region’s economic growth and community impact. This is where our ‘Texas footprint’ first landed and where we are committed to the future, ensuring both our clients’, and the region’s, success. Sign over the door of the museum. As a growing coastal town Port Arthur had need for ships and services to repair ships from early on. These businesses dot properties along the river, often off the main road. But their importance is significant. “When talking about shipyards, it’s part of an invisible industry that has hundreds of people working there doing family wage jobs,” the Rev. Sinclair Oubre, diocesan director of the Apostleship of the Sea and pastor of St. Francis of Assisi in Orange, said. Port Arthur Centennial History book. Schulz and business partner opened Gulfport Boiler and Welding Works on Seventh Street and later constructed the first all-welded barge in Port Arthur. He expanded his shipyard on a 6-acre site on the ship channel on the west end of Lakeshore Drive. By 1931 the company had 10 electric welding machines, an $18,000 investment. Then, by 1939, the company joined the war effort with the launching of a 328-ton icebreaking cutter Arundel — the first Coast Guard cutter built in Texas. According to shipbuildinghistory.com, Gulfport Boiler and Welding Works Inc. became the leading builder of ocean tugs in World War II, then was renamed to Gulfport Shipbuilding Corp. It was acquired by Levingston Shipbuilding in 1970 and became a repair yard from then until its closing in 1985. The tug the Lead Horse was built in 1969 by Burton Shipyard. A newspaper clipping from a scrapbook by Alva Carr that was donated to the Museum of the Gulf Coast. ABC Construction Training Center in Nederland will train you as a merit shop craftsperson for a career with the purchasing power of a college degree! 2700 N. Twin City Hwy. Nederland, TX 77627 409-724-7886 Associated Builders and Contractors, Inc.
Sempra LNG leads Sempra North American Infrastructure group’s efforts to develop, build and invest in natural gas liquefaction facilities and midstream natural gas infrastructure to offer flexible, low-cost and reliable LNG supply to the global market. Our goal is to become North America’s premier infrastructure company and the development of Port Arthur LNG is a key component to helping us achieve this goal. and by 1970 they acquired the neighboring Gulfport Shipbuilding Corp. in Port Arthur. Levingston shipyard was an active business until it closed its doors in 1985. The tug Spartan. The vessel started out as Lead Horse and has went under the names Gulf Challenger, Challenger and Mark Hannah before becoming Spartan in 2002. Burton’s was located between Gulf Oil and Texas Co. docks, about three miles south of Port Arthur on the Taylor Bayou turning basin, according to information from the Museum of the Gulf Coast that was included in a scrapbook. The shipyard was built in 1943 for the building of barges to be used in war. It included docks on a deep water channel; machine, woodworking, fabricating and electrical shops; overhead gantry cranes and a marine railway capable to handling vessels up to 140 feet in length. A story from October 1979 tells of the third tuna seiner built by Burton Shipyard. The 224-foot-vessel DeoLinda was the third of a seven-ship contract awarded to Burton by Van Camp Food Co., a division of Ralston Purina Co. It was built to operate primarily with the Pacific fleet, fishing for skipjack and yellowfin tuna. • Samuel’s son, “Captain” George Levingston, is considered the pioneer of Levingston Shipbuilding Co. • In December 1952, the “largest and most powerful drilling barge ever built for use in the coastal marshes was built by Levingston for the Superior Oil Co. • In June 1951, Levingston’s first compressor station was built. • The first mobile drilling platform for offshore drilling in the Gulf was delivered in January 1956. • A later endeavor was the delivery of three identical ferryboats to the Department of Marine and Aviation of the City of New York. Each vessel was capable of carrying up to 3,500 passengers and 50 automobiles. One of the boats, which ran between the boroughs of Manhattan and Richmond, was named after the late President John F. Kennedy. A photo of Gulfport Shipyard in the early days. Gulfport Shipbuilding Corporation circa 1975.
renamed it TDI-Offshore and in 1995 TDI bought the Gulf Copper rig site in Port Arthur as company revenues reached $40 million. The company changed hands several more times though the years with name changes and is remains in operation. Gulf Coast port as well as Ciudad Del Carmen, Mexico. In addition, the services offered expanded as well from steel and copper products to full ship and offshore oil rig repair, specialty offshore services, international repair teams working in all corners of the world and marine surveying and consulting services for U.S. and international interests. Gulf Copper currently has more than 470 employees with about 170 in the Port Arthur area. 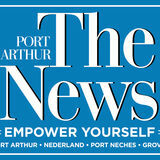 Payroll in Port Arthur is over $10.5 million with another $5.5 million purchased in goods and services. “As we reflect back on the 70 years in business on the Gulf Coast, Gulf Copper is proud of the positive impact we have made in our communities, and we look forward to building a strong future with our partners and colleagues and associates,” according to information from the company. Levingston’s engineers testing a jack-up rig in the mid 1950s.